Following on the heels of our end of year event and promotion and closure of the studio for the holidays, we're back and energized to be the storm in this new year! Discord servers across the world were plagued by an invasion of inappropriate bots joining and posting links to NSFW content. Our team stepped up and Rhaegys built a solution into our Discord server that keeps all of our players safe from this annoying drivel. Our first shiny of the year followed a period where shinies were scarce. So to make it up to everyone, we shared not one but two armor sets. Here we presented the Brudvir medium and heavy armor concept sculpts. Our next shiny was timely as the community discussed their favorite diminutive tribe. View the Kypiq medium armor sculpt in all its glory! For our Alpha 1 backers, Caspian provided some updates via the Early Access forum. We can't link to it here as it is gated for specific access by this group, but just knowing there are many updates happening should keep everyone in the community excited for what is to come! Our next impressive armor shiny was one that many had anticipated since our Jousting demo at PAX West 2017. See the Neran medium armor concept and let us know if it met your expectations. Following up on something Caspian said recently, one of our OCE moderators, Dreamar was popular this month with both a chosen top meme and a submission to the spotlight. Nice going! We don't talk a lot about our customer service or support resources and how they perform, but we'd like to think we do a darn good job of resolving most issues quickly and efficiently. In early 2017 we selected a new ticketing platform to manage our support@ and contact@ and other support needs. As a summary, our partner took our metrics and inserted them into a short video of our performance for 2018. We're proud to show how much our performance improved via this channel, keeping in mind there are several other avenues of support we actively manage as well. It isn't perfect, but we've made great strides and look forward to providing even more stellar customer support in 2019! Building a ground-breaking game is no easy task, but creating a new genre within that space is quite the feat! Our interview today is with one of our Oceania moderators, Saebelorn! He represents half of our team from the beautiful continent of Australia. "Nice to "see" you Sae! Let's have some Q&A." Q: Tell us a little about your upbringing, what was it like and where? A: "I was born in a town in New South Wales, in Australia, called Wagga Wagga, then stayed for two years as a baby in a place called Narranderra (just down the road from Grong Grong). After that, we moved into the city, where until recently I’d stayed ever since. I’d say that my upbringing overall can’t beat those names for remarkability." Q: Are you still living in the same area? A: "As of a year and a half ago-ish, we moved to the town of Ballarat. In Australia we’d call it a ‘city’, but being a very big country with relatively few people, I doubt that most players outside of Oceania would agree." Q: Would you tell us a little about what you do for a living? A: "Right now I’m studying science at university, and otherwise focusing on volunteering and casual work to build up my case for getting hired after graduation. While I don’t expect I’ll have graduated in time to assist Soulbound as a subject-matter expert, I’d definitely like to help out with my knowledge when I can. Outside of that, I like to get my hands on (and read) old books." Q: When did you realize you were a “gamer”, what game made that decision for you? A: "I didn’t have much of a choice – I think I was around three or four when we had our first DOS computer, and the first game I remember playing was Amy’s Fun-2-3 Adventure. The progression from there was gradual enough that I can’t really think of any specific point – I went from Duke Nukem II to Half-Life to Half-Life 2 to World of Warcraft to the myriad games now on Steam, and Chronicles of Elyria." Q: Do you have any favorite games you are currently playing? A: "I don’t play as many fully-fledged PC games anymore – my poor computer is about seven years old now, and can’t quite handle anything new unless it’s very simplistic. I mostly nibble at titles in my steam library (Arma 3, Hollow Knight) over time. The game I play most regularly right now, though, is a web-game by the name of Fallen London." Q: What is your favorite type of dessert? A: "I’m not very fancy – ice-cream is fine by me." A: "Definitely kangaroos – they’re resilient and prolific even after the impact of civilisation. Koalas get points out of sympathy." Q: Haha, Ok. Back to the topic, how did you find CoE and what made you stick with it? A: "I actually found Chronicles of Elyria on a recommendation thread on reddit’s r/MMORPG, back in mid-late 2017. I spent quite a while going through all of the news posts and joining up on discord, as I was suspicious of Kickstarter games following the glut of mismanaged or outright dishonest campaigns, but the amount of work done and the frequency of updates won me over. The game itself is what won me over – the concept was in fact exactly what I had been specifically searching for when I came across the recommendation post. I’ve always wanted a more down-to-earth multiplayer game with persistence and mechanics which model, but not copy, real life. I’ve been here ever since!" Q: Do you have plans for when you get in game? A: "As I’m sure the rest of players on OCE are tired of hearing, I have a single-minded personal goal – to foster an in-game library where all the books across the server’s kingdoms can be safely stored and passed down across the lifetime of the game. That coupled well with my appreciation for the Hrothi play style as highly defensible and very socially organised, so I worked with other counts to bolster the tribe’s presence on the server, ending up with our own duchy to our name." Q: How does the OCE community differ from the others in Chronicles of Elyria? A: "The most obvious is that we’re smaller – that was initially a cause for concern at the time I joined, though I joined after the worst of the alarm had passed. Since then we’ve grown substantially, and with the new kingdom of Caprakan we have a good spread across the kingdoms and tribes. I’d say of all the servers, we have the least and quietest drama – there have been issues, but nothing that has disrupted the feeling of neutrality that pervades most communities. We’ve got all four monarchs in our server’s discord, we often hop cross-kingdom to play games together (often, fittingly, Paradox Interactive games), we have a podcast which has hosted all our rulers (Oceanus FM) and there’s a lot of optimism about domain selection going smoothly. Time will tell if we hold it together in the future, but I’m proud of how far my server’s gone since I joined." Q: Favorite moment so far being an Elyrian? A: "While toward the end it was a slog, there was a real sense of banding together during the Searing Plague event, and on OCE we set up a cross-kingdom setup and set aside immediate goals for the bigger picture. It’s moments like that that make me feel like Chronicles of Elyria’s goals of setting up functioning player societies aren’t just a pipe dream. Otherwise, working together with my fellow Hrothi players has been a blast, especially as we grew from a vague idea into a genuine domain." Q: What about being a moderator do you enjoy? A: "I think my favourite part is being able to contribute to discussions. I’m mostly a soft-hearted type, and in most cases I’ll argue for clemency, but investigating and adding to talks in a way that gets to the bottom of a situation – whether that results in someone being moderated or let off the hook – is something I feel like genuinely helps." A: "I’m still something of a newbie, and the fear of accidentally pressing the wrong button is still present to an extent, but for the most part I don’t think anything is truly unenjoyable outside of extreme cases. Though, sometimes it gets tiring having to tell you all to get back on-topic in the discord! :eyes:"
Q: If you could say anything to the community right now, what would it be? A: "Get back on-topic! Okay, no, I’d say you’re all doing really good. This is one of the best communities I’ve been a part of, and I’ve been part of some very good and some very bad communities. Keep up the good work, and she’ll be right." Thanks again for sharing with us, and thank you for all of your efforts! As you may already know, our volunteer Moderators and Super Moderators spend countless, often tedious hours supporting and helping the community by ensuring peace and happiness across all of our platforms. In January, we welcomed both Dreamar and SirApetus! If you haven't visited their welcome threads, they are still stickied in General Discussion. Additionally, there are several projects, both new and brought out of temporary stasis, that the mod team will be working to complete in the next month so keep your eyes out for several exciting new projects that will absolutely benefit our excellent community members. If you have an interest in becoming a moderator for our team, please; don't call us, we'll call you! There is no application process, we constantly seek out capable, kind, considerate, helpful, and supportive individuals who have a reputation in the community of being upstanding players who are honest and have integrity, If that sounds like you and you are present in our community, keep up the efforts and we'll find you! Recently we learned about the Mercator Trading Company from their founder, Sir Arthur C. Mercator. How did you form? "One of the things that really attracted me to this game is that we, as players, will be able to compete and cooperate on far more levels than mere force of arms. And when it became clear that Selene had no merchant organisations to speak of (this was back in 2016), I figured it was worth a shot now that I was part of an early community for once. I started bouncing some ideas off of friends, one thing led to another and now we have this huge, ambitious project that only keeps growing." 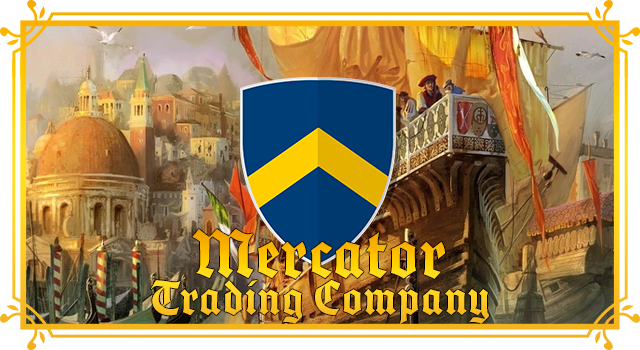 Leadership: "Mercator is governed by a council with the current dynasty patriarch/matriarch at its head, with each councilor governing a specific aspect of our company. Below that, there’s two separate chains of command: A traditional corporate hierarchy going from local employees all the way up to regional managers who report directly to the council, and a franchise-like structure for those who want to work with us but have already established their own business and value their independence." Purpose of the Organization: "Ultimately, to boost the economy of the entire kingdom and to lead in an age of prosperity across Elyria. Practically, this means we will build a nation-wide network that connects merchants with their suppliers and customers, and using the capital we gain through that to set up various financial services that will further enhance the flow of capital. And of course, we plan to get rich on the side. :)"
Motto/Slogan: "Either find a way or make one." Fun Fact: "Did you know that baby bunnies are called ‘kittens’? (This might not seem very relevant, but Maxwell politely insisted we do our part in ‘spreading their glory’, while holding a rather agitated canis rabbit uncomfortably close to my face.)" Thank you Arthur for introducing the community to your Trading Company! For January, we are introduced to the Kingdom of Alésia. These kingdom details were shared with us by their Monarch, Phyllain. Leadership: "The Kingdom of Alésia conducts itself as a traditional feudal monarchy with a few, more modern, adjustments where necessary. The position of Head of State lies with our King, Phyllain Xeilias. He is advised by his Queen-Consort, Violet, and three distinct groups. The Ducal council, made up by the Dukes within Alésia, is the first of these, tasked to keep the peace within the kingdom's borders and project strength abroad when called. Second, is the Crimson Council, staffed by those recognized by the Crown as leading experts in a particular field. Lastly, the Conclave, a body composed of members from each duchy given the opportunity to assist the King in writing legislation, as well as to provide local perspective on larger kingdom issues. Each of these groups work together with local leadership to ensure that Alésia faces every threat, domestic or foreign, prepared." Kingdom colors: "Black and White"
Kingdom crest: "Same as above"
Goals of the Kingdom: "As a central kingdom on the continent, Alésia will facilitate the trade of goods and ideas from all corners of the world. Acting as a trade hub for the continent will help provide the wealth required to ensure Alésia remains a strong, independent, and capable kingdom that explores the edge of the technologically possible, giving us an advantage in all endeavors." 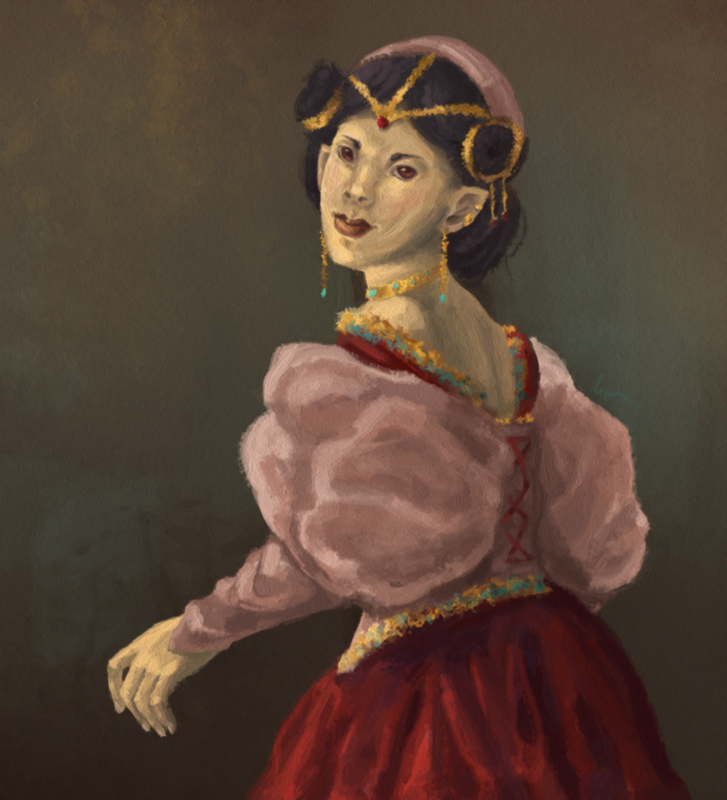 Fun Fact: "Alésia differs from our counterparts in many regards, but one in particular stands out among them: Where other kingdoms are made up of those who purchased their packages outright, much of our nobility attained their rank via crowdfunding their titles. Along with Demonstrating the necessary drive and ambition to rule by making such an attempt, the would-be aristocrats were required to provide their goals, plans and other proofs of concept, in order to draw support from the community. The nature of our formation, coupled with the concept of a Conclave not based upon what package one bought, makes Alésia stand out from the other kingdoms simply and fundamentally by laying the foundation for building a culture of meritocracy." Closing statement: "As many are quick to remind our community, Chronicles of Elyria has yet to release. When it does, there will exist many growing pains from the transition of theoretical to practical. The Kingdom of Alésia, since its inception, has done its utmost to counter the worst effects these pains may cause. We devote ourselves to a single, centralized government with a clear delineation of duties and powers. We chose to focus upon trade while being prepared for war so that our friends may grow prosperous along side us. Through strength or arms we bring peace is the motto of Alésia. We seek to embody those words in CoE so that Alésia will stand tall along side the other Kingdoms of Luna." 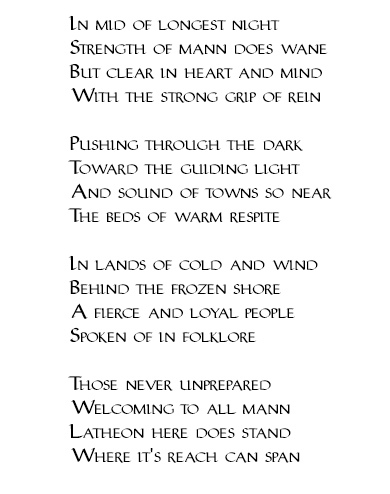 Dreamar submitted this lovely written piece titled: "A poem about Winterswatch, as observed by my County". Tribemoji winner Elsy continues to submit her works of art. This month we received her take on To'resk Nobility. 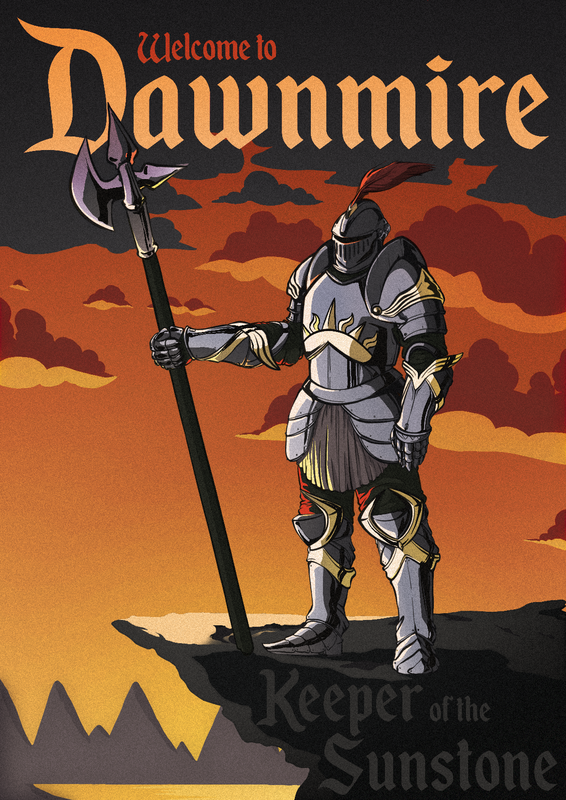 NA-W (Angelica) Sunstone winner Huldric submitted this promotional piece for his Duchy. To help you get to know our team better, we try and interview one developer each month, or as often as is possible. This month we are introduced to Vanimus Prime, a Chronicles of Elyria character artist working at Soulbound Studios. Q: So Van, thanks for doing this little interview. Tell us, where are you from? A: "I was born in Vietnam but came to the states when I was only 2 so I don’t remember anything from that time. I grew up in Seattle and moved to New York when I was 18 and lived there for 6 years before coming back to Seattle." A: "That list HUGE and continues to grow but if I had to choose right now….. I’d go to Peru and take some time to backpack the Inca Trail to Machu Pichu. The landscape and ruins look amazing!" Q: If you could choose, would you travel to the past or to the future? Why? A: "That’s a loaded question. Can I peek my head into the future to make sure it’s not a dystopian nightmare or a post-apocalyptic wasteland? If all of the world’s problems have been solved then definitely the future. If not, can I choose who I am or at least what my social and economic status is. I would hate the scenario of being zapped to the past and quickly get burned for being a warlock or live as a poor starving peasant. I want to say I’d travel back to Rome at the height of the empire and be able to see at full construction what we today have only seen as ruins…. but a part of me just wants to travel back 15 years and make future me extremely rich." Q: For how long have you been drawing? A: "I don’t remember ever not drawing. For as far back as my memory can take me, I’ve always excelled most at drawing and art over everything else." Q: Do you have any traditional art training or are you self-taught? A: "Most of what I know is self-taught but with a focus on traditional life drawing, classical painting, and sculpture. I’ve spent endless hours studying and observing renaissance era masters, comic book artists, fantasy artists, illustrators as well as several contemporary works for inspiration. College gave me some professional direction and focus as well as peers to exchange ideas with but it’s been my own research and personal projects that I’ve learned the most from. I’m a big believer in foundational art skills being able to translate to nearly any tool you need to use." Q: What was your first art piece you were truly proud of? A: "That’s a really tough one to pinpoint. Growing up, our fridge was just a rotating gallery of my current work. I’m always looking to improve so the bar is raised every time I make something I feel proud of and the feeling only last a short time before I start seeing where I could have done better. I think the most proud I have been is not any single piece but actually the first time I filled every page of a sketchbook front and back with what I thought were significantly better drawings than any sketchbook that came before it. 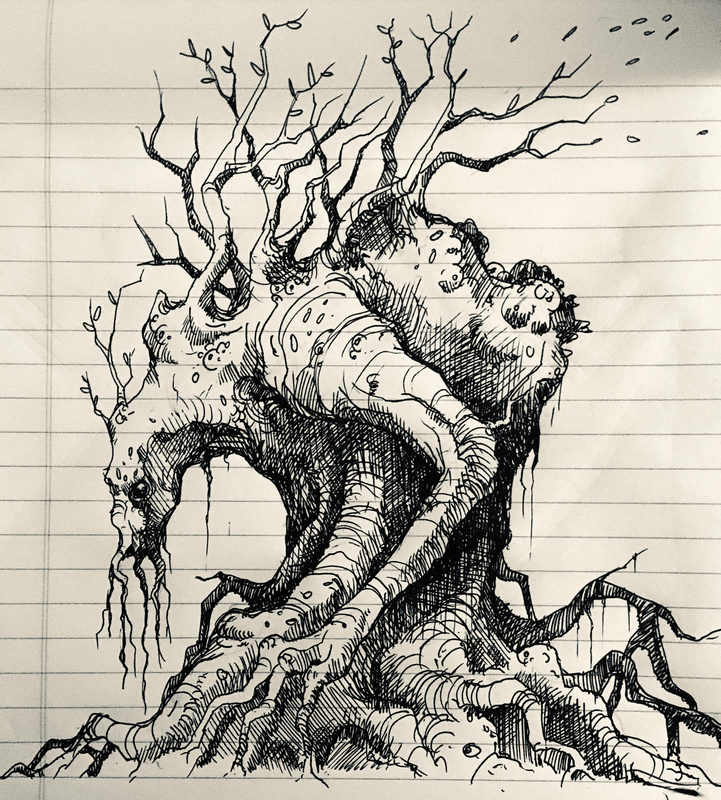 I still feel that sketchbook was the biggest leap I’ve made." 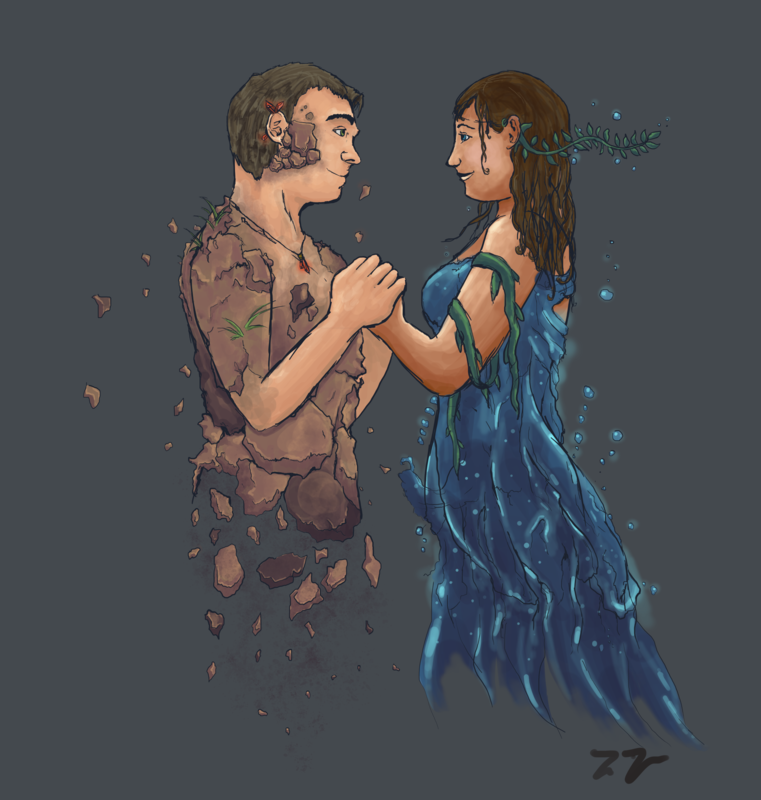 Q: Would you like to share your favorite CoE related piece of art? A: "Eddie (Heat) is king when it comes to concepts and illustrations here so I only get a few rare chances to dig into that side of our production. I had a lot of fun making the Kypiq village concept." Q: What attracted you to Chronicles of Elyria? A: "The concept sounded amazing but also nuts to me initially. It’s a massively ambitious project. There’s really nothing fully like it out there. The talent, passion, and leadership I work with gives me a lot of confidence. It’s a game I can see myself putting a lot of hours in playing so I want to be a part of developing something I think I’ll be extremely proud of. I also love creating creatures and there is no shortage of those in this game." Q: What's your favorite tribe aesthetic so far? A: "Tough but I think I lean Janoa. Big, muscular, hot weather jungle brutes with stripes?! Yeah, I think that looks pretty cool." Q: What are you planning to do in game? A: "I want to say be a hero and adventurer but if the opportunity comes, riches and power is pretty appealing. I’ve historically been some sort of rogue in most RPGs I’ve played so I’m sure I’ll follow that pattern one way or another in CoE as well. I think I’d really enjoy being an elusive Elyrian ninja." Thanks again for allowing us a little insight into Vanimus Prime! The Chronicles of Elyria community has a Reddit community, lovingly managed by Hellmoon, Mickdude, and ImbuedGreen. 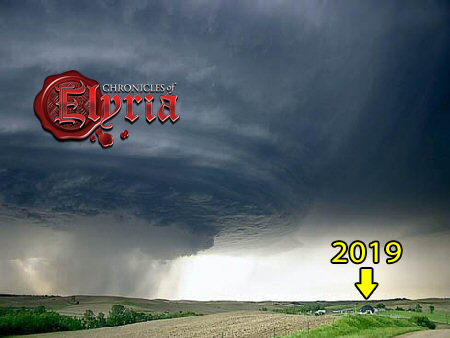 "The Chronicles of Elyria subreddit has made big strides in adjusting their now loosened advertisement policy. While it is still against the rules to post for the sole purpose of advertising one's domain/organization/etc, the rules have been adjusted to allow constructive discussion regarding these player run groups." "There’s a particularly fun kingdom meme up on the subreddit at the moment (that has also circulated through other communities) and I’m sure everyone looks forward to many more!" "In addition, the subreddit user-flair has undergone its first change in quite a while: simplifying flair to the different class levels (instead of package tiers), as well as adding in servers and all kingdoms so users have a choice on what they would like to flair themselves." Next, I'm excited to announce that we've added a fourth community moderator to the subreddit as SirApetus joins!! 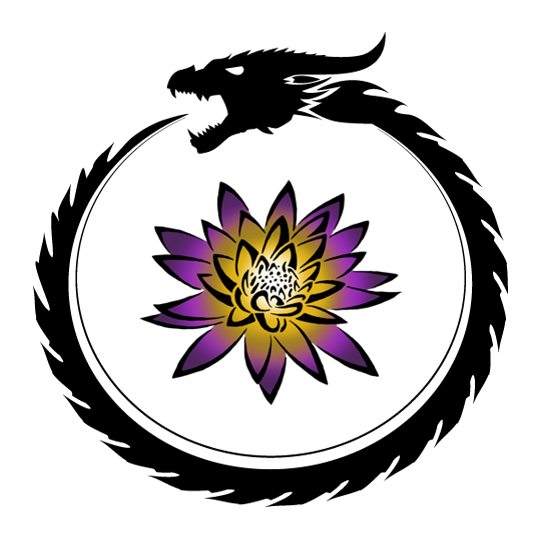 Welcome to the team and thank you for helping out! If you are interested in joining our subReddit, find it here. Learning Elyria is the newest show on this list, it is "a series hosted by Jason and Ryan from Jbros (forum names Duyo and MeltedWater). We are a new weekly show that covers different topics from Chronicles of Elyria as well as starting a weekly lore show." A CoE Talk show from and for German speaking community members is online, hosted by Olaf Biebelix, Loki and Creamas. The Arkadian Herald "focuses on creating presentation videos for CoE from the Kingdom of Arkadia in different European languages to help people that don’t speak English. or speak very little, to learn about the game and its major features. As of now the covered languages are : English, French, Italian and Russian. A new series of videos exclusively in English, focusing on debating on specific matters regarding the game are being worked on right now. We hope to see you soon to help us spread the world of CoE to the World!" Conclave 360 is “a community based discussions channel that seeks to help people find their home in the larger Elyrian community. Videos focus on topics ranging from introducing local community leaders, guilds, associations, and schools to discussions on how the mechanics “as described so far” will impact those people and institutions." Vendor Trash is " two guys with a laundry list of gaming street cred dating back to the 80’s. It was first a failed dumpster diving blog, then they failed at motivational speaking, and then finally found their calling talking about Chronicles of Elyria. They are excited the game they've always dreamed of is finally being made. After many episodes they are still going strong, come join their throbbing obsession." This month we interview one more of our original Ambassadors and learn all about Imshada. On a personal note, I want to say thank you as not only did Imshada respond to this interview, he included all of the markdown! <3 you for that! Q: Tell us a little about where you grew up? Q: Anything exciting happen between now and then you’d want to share? A: “That depends very much on your definition of exciting, my friend. I’ll go with “yes,” although that’s probably open for debate. I guess the first thing to know about me is that I’m a ravenous learner and a diehard jack-of-all-trades. I’ve never been able to discern any rhyme or reason to my interests, but I’ve had a lifelong habit of latching onto the strangest things on a whim, and trying to teach myself absolutely everything that I can about them. Most of the “exciting” things I’ve done in my life probably have something to do with one of the many hobbies or skills that I’ve taken to teaching myself over the years, so I guess I’ll list a few. 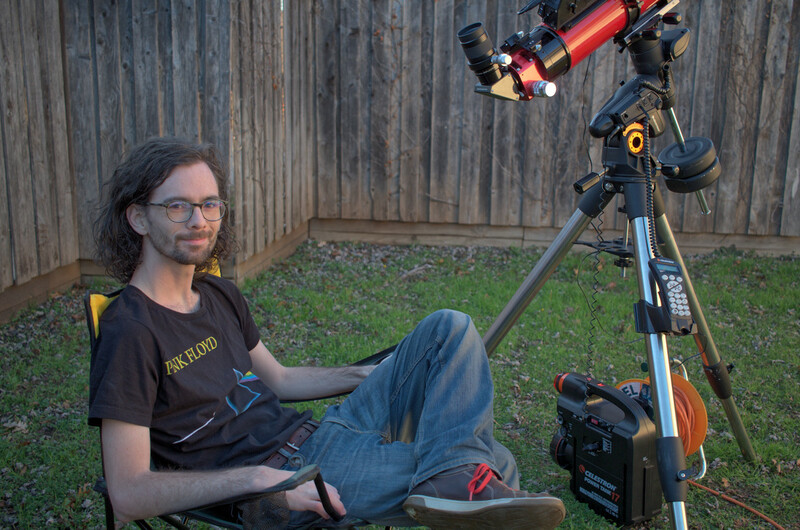 One of the more recent ones I’ve taken up is astronomy, which all started with my granddad showing off his new telescope to friends and family one evening, and now has me in training to become an observatory operator assisting with exoplanet research in conjunction with NASA. For fun. I did mention having crazy hobbies, right? I grew up in the suburbs where light pollution is absolutely awful, so the actual night sky was always “out of sight, out of mind” for me until recently. If you walk out my front door and look up, you’ll see nothing but goopy gray ugliness and like, maybe two dozen stars on a good night. Drive a couple hours south into the outskirts of the Texas Hill Country, though, and you’ll really start to see something. Turns out the stars at night really are big and bright out there. (Pee-wee fans, that one was for you.) Then add a telescope into the mix, or even just a decent pair of binoculars, and you’ll be amazed at what’s out there. There’s something truly surreal about being able to stare into the back of a big metal tube, and see light coming at you from a galaxy millions of light years away, that’s been barreling through space since before the dawn of mankind, only to enter your eye, out of all people, at that exact moment. It really puts things into perspective. Q: I understand you are a programmer, can you tell us about it and your aspirations? A: “I’m definitely a programmer/engineer at heart, if not by trade. I’d describe programming as the first “skill” that I ever developed; I’ve been doing it since I was in elementary school… nine, maybe ten years old? Somewhere around there. My first language was QuickBASIC, which was this relatively simple language developed by Microsoft back in the early 90’s. My dad is an engineer, and had it installed on his chunky work laptop which he had left at home one day. I think I complained to my mom that I was bored, and she figured it was something I might enjoy poking around with, so she pulled it up, showed me the few things she knew about it, and let me have at it for the rest of the day. When my dad got home, he showed me how to pull up the documentation for the language, and I used that to teach myself every day when I got home from school. Within a couple months, I probably knew more about it than my dad did. I was making my own little Zork-style adventure games, strategy games, some basic 2D graphics… it wasn’t much, but that was my first taste of working with computers, and I was hooked. By the time I graduated high school, I had moved on to more “mature” languages, and was focusing pretty heavily at the time on web development. 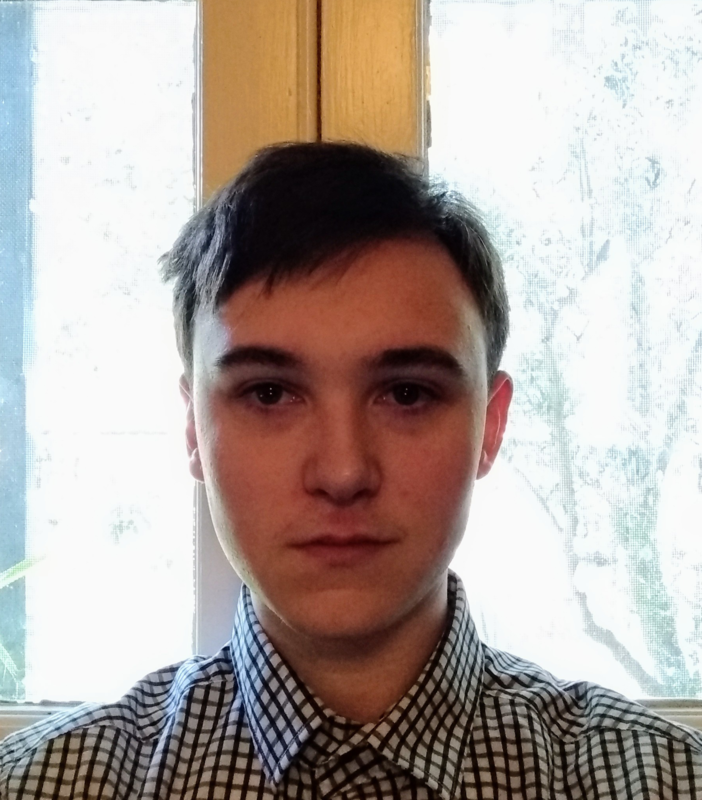 I had always planned on going to college, and needed to choose a major, so software engineering seemed like the obvious choice. I didn’t take many software courses my first two years, and the ones that I did take were honestly really boring, since I already had strong fundamentals in programming and there wasn’t any way to test out of most of the easy 101-level courses. I slogged through it, though, and when I finally got to the more advanced stuff… I suddenly realized that programming wasn’t even remotely what I wanted to do with my life. Funny how that works, no? Q: Star Wars versus Star Trek? A: “Oh, boy. We’re opening that can of worms? So, short story: Trek, at least for me." Q: You’ve been a part of the CoE community for a long time now, what initially drew you to the project? A: “I first heard of CoE during the media blitz that accompanied the launch of the Kickstarter campaign, and backed at the Bloodline level almost immediately. By the end of the Kickstarter, I had upped myself to Count, and at some point later I upgraded again to Brewmaster. Q: You have been involved in many community efforts, including some graphical charts when the Tribes were first announced. What drives your desire or passion surrounding such works? That said, the ways in which I've tried to do that are much more personally motivated. Many of them, like founding the Elyrian Linguistic Society or making my series of CoE infographics, come from my own personal interests and what I enjoy doing. Others, like serving as an Ambassador, an admin of the Elyrian Community Lounge, and a recurring guest on The Town Crier, come from a desire to engage with the community as a whole and make it a better place. Q: Ok, time for an opinion. Is 3D unnecessary? Do studios make films in 3D just to charge more money? Q: What are your plans for when Chronicles of Elyria launches? A: “Right now I’m locked in to play as a count on Angelica (NA-W,) but haven’t formally declared for any kingdom or duchy. The most important thing for me is landing in Kingdom 3 so that I can claim my county in the desert and play as The Waerd, so I’m leaving my options open for now. There’s a decent chance I’ll end up joining Pteroguin’s duchy of Vandiir eventually, but I’d like to hold out a bit longer and see how things are lining up a bit closer to domain selection. I figure I’ve waited this long already, I might as well see it through all the way. Q: As one of the first Community Ambassadors, what do you like about the role? Q: Least like about it? Q: Now, the most important question of all: Could Jack have fit on the door with Rose? Q: If you could say anything to the entire community right now, what would it be? We really appreciate learning more about you! Speaking of Imshada, if you are at all into celestial observations on Earth, check out this lovely video he made of the recent lunar eclipse! Late last year there were a couple of Ambassador nominations. Those that met the minimum criteria for nomination were put up for vote and for feedback by the community in January. With all votes tallied, comments reviewed and everything considered, we're proud to introduce to you your newest Community Ambassador West, also known on Discord as Count Vestan Drake. Please join me in congratulating him!! Next month, we have several more Ambassador nominations that may result in more polls for you, so keep your eyes peeled! I am now meeting with the Design Guild on a per sprint basis to ensure we are inviting and reviewing our SME candidates and engaging with our approved SMEs on a consistent basis. With this new plan in place, expect more news on our 2nd round of invites, as well as more interaction with our existing Subject Matter Expert members. Learn more about the SME program here. Inventory Stacking - this will bring many desired features to your inventory pages. Surname tokens - extending or changing your surname reservation will become a reality. Title transfers - You’ve been waiting for it, we’re working on it! Trading titles for EP - If you situation has changed, this may be your solution! Package merging/claiming - This is your chance to claim that extra package in your inventory. February promo - We’re confident you’ll guess the theme, but this year we have new surprises in store! Player event rewards - We want to deliver your previously earned prizes, however there is some preparation needed. Soon we’ll be granting your Conquest, Kickstarterversary, Searing Plague, Lost Vault and other prizes you’ve earned up until now. 0.5.0 Production update blog - See all of the progress we’ve made in our latest development adventures. Domain and Settlement Selection - One of the most anticipated pre-Alpha features, we’re working hard to ensure it is intuitive, exciting, and provides our players the ability to choose their domains easily and successfully. This isn’t all of the things we're working on, but it gives you an idea of some of the more significant projects we have releasing in the near future. At least my first surname was interesting enough to make the favorite declines list! One of my favourite routines: coffee and a read of the CJ. Listen close I'll only say this once. Good games are ruined by unreasonably unrealistic timeframes. We see this all the time, especially with MMOs like Fallout 76. If they would have pushed that back another year, it would have been awesome. They played into the hands of their fans and made a bad game. Also, a good concept does NOT make a good game. If the developers feel as though it is reasonable to push this back another 3 years, so be it. There should not be any rush, this is an AMAZING concept, if this goes well there will be many, many, many, games that model this one. I don't want the money I've spent on this game to be wasted. I don't care if I've almost literally thrown a nickel at this game. Also I'd really like to know if you guys do become overly successful and become filthy rich off of this game if you'll fund a more immersive VR gaming. Chronicles of Elyria, first person, in the most complex setting ever imagined and designed, that is actually really close to fruition, sounds like a dream. I'd like to leave my own life and jump into this world. It sounds like a nice escape from reality. Wish the DEV team the best, I hope to hear more about the game in the next Journal, no offense, but that's what I'm really logging on every month for. Listen close I'll only say this once. Good games are ruined by unreasonably unrealistic timeframes. We see this all the time, especially with MMOs like Fallout 76. If they would have pushed that back another year, it would have been awesome. They played into the hands of their fans and made a bad game. Also, a good concept does NOT make a good game. If the developers feel as though it is reasonable to push this back another 3 years, so be it. There should not be any rush, this is an AMAZING concept, if this goes well there will be many, many, many, games that model this one. I don't want the money I've spent on this game to be wasted. I don't care if I've almost literally thrown a nickel at this game. Also I'd really like to know if you guys do become overly successful and become filthy rich off of this game if you'll fund a more immersive VR gaming. Chronicles of Elyria, first person, in the most complex setting ever imagined and designed, that is actually really close to fruition, sounds like a dream. I'd like to leave my own life and jump into this world. It sounds like a nice escape from reality. Wish the DEV team the best, I hope to hear more about the game in the next Journal, no offense, but that's what I'm really logging on every month for. so what was the live stream about in December ("We are planning a public live stream in December that will be unlike any you've seen us do before, you won't want to miss it!" - community Journal, November 2018). And is there anywhere I can watch it now? And lets talk about that when i got Alpha 2 access it was meant to be available from 0.4.0 yet again SbS fucks us and cheats us out of the experience we paid to be a part of! BTW you can tell this was just rushed out to hit the deadline knowing it contains zero real information. FFS get it together. Yet again a wall of text with only information is Soon™ Nothing new to show just talks about the same looking armors that they been doing for a year. LOL And lets talk about that when i got Alpha 2 access it was meant to be available from 0.4.0 yet again SbS fucks us and cheats us out of the experience we paid to be a part of! BTW you can tell this was just rushed out to hit the deadline knowing it contains zero real information. FFS get it together. Your Alpha 2 experience is still there, it's just pushed back. No one took that away. > And lets talk about that when i got Alpha 2 access it was meant to be available from 0.4.0 yet again SbS fucks us and cheats us out of the experience we paid to be a part of! Your Alpha 2 experience is still there, it's just pushed back. No one took that away. I think you may be confusing this community journal for a developer journal. Posted By **Watru** at 09:02 AM - Fri Feb 01 2019 > > BTW you can tell this was just rushed out to hit the deadline knowing it contains zero real information. FFS get it together. I think you may be confusing this **community** journal for a developer journal. Now all we need is that amazing concept art in-game ... hint hint! You thank your Interns, I mean slaves, I mean robots; We are of different minds Caspian. Next thing I know all of the team with be on Team Dad Jokes when Team No Dad Jokes is clearly superior. You can't criticize it without playing it, but you can praise it without playing it. 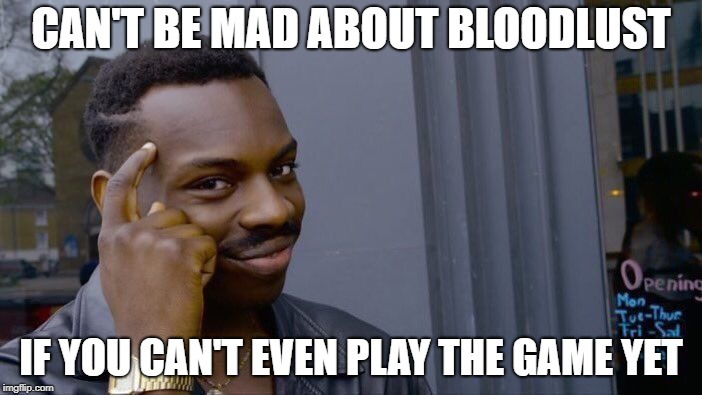 Can't be mad about bloodlust if you can't play. Definitely can be excited about anything related to COE although you can't play. All criticism is due to people being heretical or being unwarranted crybabies whining about something they can't experience. All praise is entirely justified from the faithful and mature hyped up about something they can't experience. It's important to know the subtle but significant difference. You can't criticize it without playing it, but you can praise it without playing it. Can't be mad about bloodlust if you can't play. Definitely can be excited about anything related to COE although you can't play. Logical consistency. All criticism is due to people being heretical or being unwarranted crybabies whining about something they can't experience. All praise is entirely justified from the faithful and mature hyped up about something they can't experience. It's important to know the subtle but significant difference. Congratulations on creating and claiming the title of the first official MEOW! Also congratulations to Count Vestan Drake. Alot of interesting content, not just by the developers but also the community. Congratulations on creating and claiming the title of the first official MEOW! Also congratulations to Count Vestan Drake. Alot of interesting content, not just by the developers but also the community. Why would it be the final round? I can get that soon enough IP won't be anything more than show. But seeing as you give away store credit as well, I thought it would be kept going for that alone. Looking forward to seeing that 0.5.0 blog. *2019 IP rewards round - As we did last year, we’re planning a final round of IP rewards for contributions prior to D&SS. * Why would it be the final round? I can get that soon enough IP won't be anything more than show. But seeing as you give away store credit as well, I thought it would be kept going for that alone. Looking forward to seeing that 0.5.0 blog. Love the memes and the interviews! Thank you for another great CJ! Yay, my meme made it into a DJ!